Why chocolate experts think the Mast Brothers are frauds. A blogger has come out with damning allegations about the Brooklyn chocolate company’s early days. Are these chocolate bars really bean-to-bar? “Chocolate Experts Hate Mast Brothers.” In March I wrote a Slate story with that headline, and the past two weeks have proven just how deep that disdain runs. Starting on Dec. 7, a food blogger named Scott, who runs a site called Dallasfood.org, has published a four-part series alleging that when they started out, the Mast Brothers didn’t make their own chocolate. (I interviewed Scott for this article, but he asked that I not use his last name because he doesn’t want his blogging to affect his day job, which is not related to chocolate.) He calls the Mast Brothers the “Milli Vanilli of chocolate.” Scott’s claims raise a provocative question: What if the chocolate world’s poster boys of authenticity started out as big ol’ fakes? We completely refute all of the allegations—which are unfounded and factually incorrect. We have always taken great pride in how we make our chocolate. We made our chocolate from “bean to bar” when we started—and we still do now, in New York, London and, soon, Los Angeles. We will continue to innovate and experiment, and we’re excited for what lies ahead. In 2008, Mast was getting countless positive reviews and attention for their good chocolate, but chocolate experts Scott quotes and experts I’ve interviewed weren’t sure they were actually making that chocolate. “Astonishingly, given the amount of New York-based media coverage during this period,” Scott says, “no journalist reported having seen the Mast Brothers make chocolate.” The labels themselves had almost no information about the chocolate. When the brothers did eventually reveal ingredient lists in late 2008 and early 2009, cocoa butter, vanilla, and soy lecithin made an appearance. These ingredients are anathema in the American bean-to-bar world, which prides itself on two-ingredient chocolate (cacao and sugar), but are common in the commercial chocolate world. The extensive number and type of bars (including milk and white, both of which are challenging to produce) also seemed suspicious to those familiar with the chocolate-making process. Most small bean-to-bar makers scrounge to save up enough money for one batch of beans and then spend an inordinate amount of time perfecting one type of bar before moving on to another. How did Mast have a dozen almost immediately? Scott says that Rick answered the question himself at the Fancy Food Show in 2008, where Pollard of Amano Chocolate says Mast told him that three of their bars were made with Valrhona. Scott’s reporting, which relies on on-the-record interviews with multiple well-respected chocolate makers and experts, is damning. And I’ve spoken to other sources familiar with Masts’ practices who corroborate Scott’s allegations. Philippe-Louis Houzé, the owner of L’Epicerie, a specialty-food retailer that imports Valrhona and other fine chocolate, told me that he sold the Mast Brothers “very good chocolate made in France” years ago and continues to sell them “some goods,” though he wouldn’t name the exact products. In the summer of 2009, experts noticed that the chocolate started tasting radically different. “The distinctive traits of the cacao—bright, fruity, acidic—shone through, unfiltered and uncontrolled by conching,” Scott remembers. “The texture was coarse and muddy.” Lindley, the co-owner of Cacao, is more direct: “Most of the chocolate was simply inedible, by my standards.” Scott alleges that this is when the brothers actually started making their own chocolate. That audacity is the heart of the problem. The brothers have repeatedly taken credit for the whole American craft chocolate movement, with Rick saying things like, “We’ve had to come up with how everything is done every step of the way because there was no such thing as small-batch chocolate makers.” As Scott points out, other makers, like Amano (founded in 2006), Patric (2006), and Taza (2005) were well on their way by the time Mast appeared on the scene. 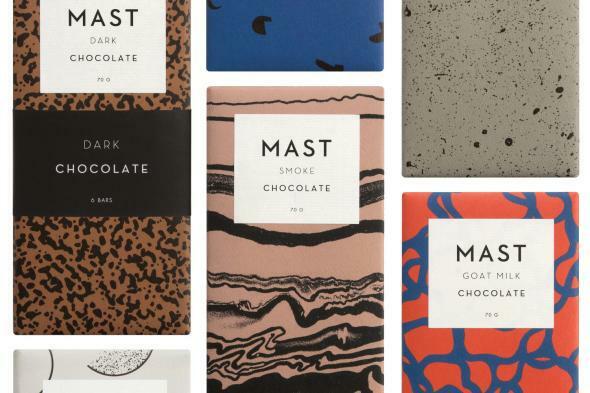 Mast has undoubtedly done great things for small-batch chocolate makers: With their attractive packaging; youthful, hip fashion; and marketing genius, they are the face of the movement, educating the public about craft chocolate and bringing a higher-end product to specialty and grocery stores alike. But the most appealing part of the brand might be its story: two impressively bearded brothers from Iowa who pioneered craft chocolate, bringing beans by sailboat from across the globe to their Brooklyn factory, where they meticulously craft the best chocolate you’ve ever tasted. It’s a story about authenticity, but Scott’s allegations suggest elements of it might be inauthentic. The brothers have certainly been disingenuous with their customers: taking credit for a movement that they helped build but didn’t create single-handedly. Why not give a shoutout to Nanci when they talk about their early days? Why not foster relationships with other chocolate makers—as is common in the industry—rather than build a silo around themselves? The easy answer would be that they’re unscrupulous opportunists, and unfortunately, that’s what a lot of the chocolate industry tends to think. The more nuanced answer is that there is incredible pressure on small brands to be authentic, individual, and unique, and that pressure can lead companies down strange paths. Within the artisan food industry, the story of the food has become as important as the food itself: In fact, it’s now part of the product. Karine Chrétien Guillemette, who owns the chocolate specialty store La Tablette de Miss Choco in Montreal, said customers care most about the story behind the chocolate—even more than the way the chocolate itself tastes. That’s what makes it authentic to them: She said they’re more likely to buy a $10 bar if they know, for example, that Shawn Askinosie of Askinosie Chocolate left a 20-year career as a defense attorney in order to make it and share the profits with his farmers. “People want something extra when you hand them a gift of food,” said Bjorn Quenemoen, the co-founder of artisan popcorn company BjornQorn. “By the way it’s made in Brooklyn, or by the way it’s sun-popped.” BjornQorn has built its reputation on popcorn popped by the sun with giant mirrors (I know, I know), but as demand has outpaced supply, he’s supplemented with conventional methods, all while keeping “sun-popped” on the label. Is he trying to trick the consumer? No, he’s simply trying to figure out how to run a successful business. To give the Mast Brothers the benefit of the doubt, perhaps that’s what they were trying to do at the beginning as well. There’s one big difference however. “We try to be totally upfront about what we do,” said BjornQorn co-founder Jamie O’Shea. That’s why they’re planning to put the percentage of total solar power used on the label, similar to a Danish program that designates companies that use more than 75 percent wind power. Mast seems to be taking an opposite tack: In their new 12-bar product line, they’ve removed all information about cacao country of origin or source from their labels. They’ve also closed their main factory, on Brooklyn’s Washington Avenue, to public and professional tours. Near the end of their open letter, the Masts write, “We are steadfast in our guiding principles of simplicity, honesty, connection, innovation, love and respect.” But a one-sided open letter isn’t the same as a real conversation about the bean-to-bar movement. The letter may not convince other craft chocolate makers and connoisseurs that the Masts’ simplicity, honestly, connection, innovation, love and respect are real—and not just marketing. Due to a production error, the wrong version of this story was initially posted. It was replaced with this correct version shortly after publication.